BODEGA BAY, Calif. -- A CHP helicopter rescued four boaters from the waters off the coast of Marin County Saturday afternoon after windy conditions caused problems for two different boats. Around 2:15 p.m., the Marin County Fire Department requested the assistance of the California Highway Patrol Air Operations unit's helicopter to assist with the search of two boaters on 10 Mile Beach, near Point Reyes, according to the CHP. The helicopter located one of the victims on the beach with three Good Samaritans who were protecting her from the winds, which were traveling about 40 to 50 miles per hour, CHP officials said. The helicopter landed on the beach and transported the victim to the Abbotts Lagoon trailhead parking lot where an ambulance was waiting to provide the victim medical attention. The female victim had suffered a leg injury that was not considered life threatening, according to CHP officials. The helicopter then returned to the beach to locate the second victim. The helicopter, along with the Marin County Fire Battalion Chief, located the second victim near the capsized boat, which had been pushed ashore, CHP officials said. The victim was lying down on the beach, as two Good Samaritans were also protecting him from the high winds and blowing sand. The second victim did not appear to be injured, but was taken to the parking lot for medical evaluation, CHP officials said. The Good Samaritans had given the victims dry clothes and assisted them until the helicopters arrived, according to the CHP. The sailboat had begun in Bodega Bay and was traveling to Berkeley when it encountered high winds, which broke the main mast and then the tiller. 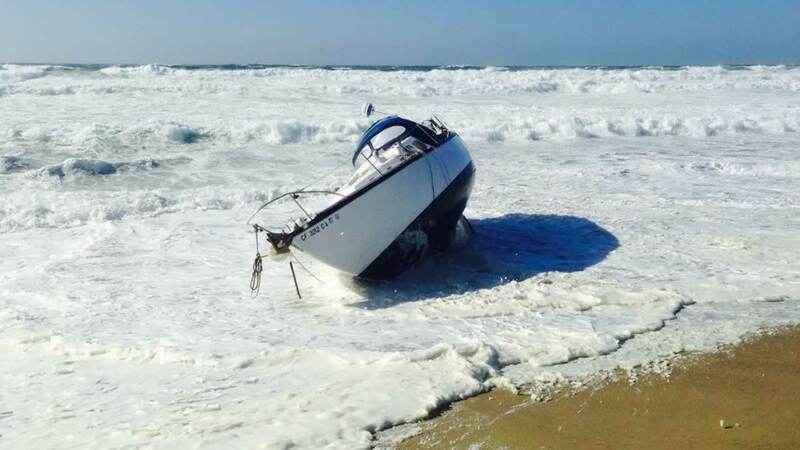 The boat was then pushed ashore, where it had capsized on 10 Mile Beach, CHP officials said. At roughly the same time a 14-foot Hobie Cat sailboat capsized in Tomales Bay south of Nick's Cove, sending two men with lifejackets into the water. They were located by a United States Coast Guard helicopter and subsequently rescued by Marin County Fire personnel in rescue watercraft. Neither boater required hospitalization, according to firefighters.